True resistant hypertension is uncommon in general practice. Measure blood pressure according to guidelines. False high blood pressure readings should be excluded. 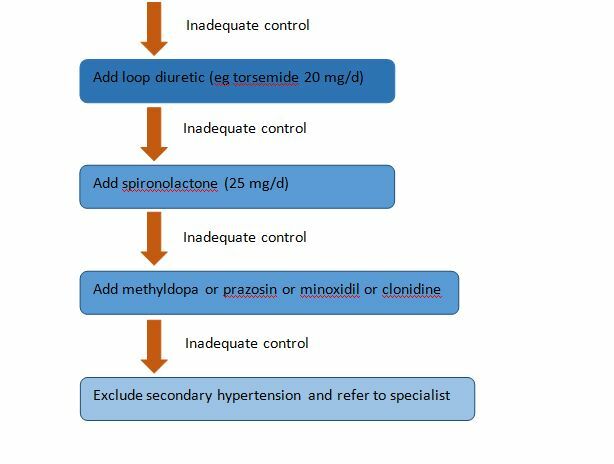 Review vasopressor medications and drug therapy for appropriateness of drug dose and combinations. Salt restriction, weight reduction and stress management are essential. Rule out white coat hypertension by measurement of blood pressure at home or by ambulatory monitoring. Treat obstructive sleep apnoea, if present. If these measures fail, consider taking the opinion of a specialist or hospitalising the patient. Renal denervation by catheter-based radiofrequency ablation of the renal sympathetic nerves lowers the blood pressure in patients with resistant hypertension. Fagard RH. Resistant Hypertension. Heart 2012;98:254–261. The 6th report of the joint national committee on prevention detection, evaluation and treatment of high blood pressure. Arch Intern Med 1997;157:2413–2446. Parker MG. Resistant Hypertension. Am J Kidney Dis 2008:52:796–802. Yiannakopoulou ECh, et al. Adherence to antihypertensive treatment: a critical factor for blood pressure control. Eur J Cardiovasc Prev Rehabil 2005;12:243–249. Vrijens B, et al. Adherence to prescribed antihypertensive drug treatments: longitudinal study of electronically compiled dosing histories. BMJ 2008,336:1114–1117. The 7th report of the joint national committee on prevention, detection, evaluation and treatment of high blood pressure NIH publication NO 04-8230. August 2004, pages 59–60. Gaddam KK, et al. Characterization of resistant hypertension: association between resistant hypertension, aldosterone, and persistent intravascular volume expansion. Arch Intern Med 2008;168:1159–1164. Nishizaka Mk, et al. Efficacy of low-dose spironolactone in subjects with resistant hypertension. Am J Hypertens 2003;16:925–930. Krum H, et al. Catheter-based renal sympathetic denervation for resistant hypertension: a multicenter safety and proof-of-principle cohort study. Lancet 2009;373:1275–1281. Simplicity HTN-1 Investigators. Catheter-based renal sympathetic denervation for resistant hypertension: durability of blood pressure reduction out to 24 months. Hypertension 2011;57:911–917. Mosen Ibrahim M. Egyptian Hypertension Society President’s message, December 2013. Available from: www://ehs-egypt.net. Accessed January 2016. 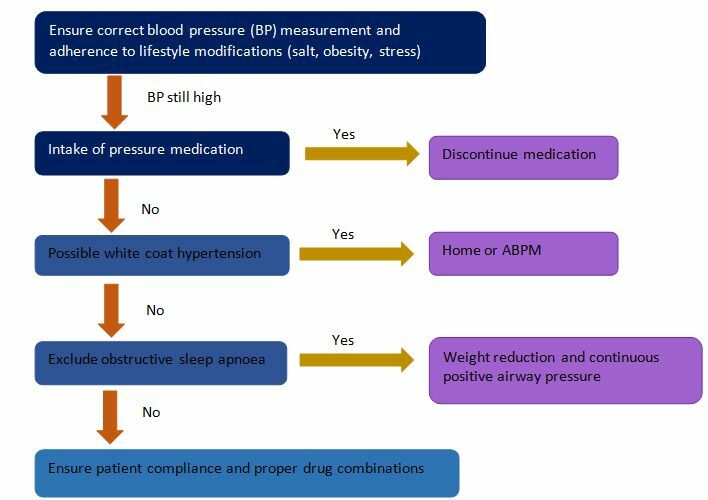 Adapted from: The Egyptian Hypertension Society: EGYPTIAN HYPERTENSION GUIDELINES.